Now that Spring is here and hints of Summer are starting to bloom, one of my favorite past times is to sit on the deck in the early evening and watch the Hummingbirds buzz around me. They sound like a large bug zipping back and forth, but when they land on the feeder, they give you just a few seconds to see just how beautiful they really are. 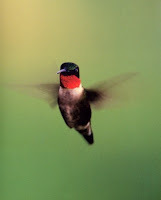 Hummingbirds wings move in a figure eight pattern that allows them to hover and fly in different directions. They do not migrate in flocks, but fly alone. The reason they look like a blur when you see them is because their wings beat 50 times per second. Hummingbirds cannot fly until their body temperature reaches 86 degrees. Keep your feeders out each year…Hummingbirds have excellent memory. Those that visit you this year were most likely the same ones you saw last summer. Hummingbirds can be seen very often in rural and suburban areas, but are also spotted in big cities like Minneapolis and St Paul. No discrimination here…they just go where the food is. They are most attracted to red flowers. Try Pentas, an annual in the north that can be dug up and brought indoors for the winter. Treat them like a house plant till the next spring and them present them to your yard again after the last frost. And make sure to watch the water level of your feeder. Hummingbirds can drain them in just a few hours when hungry!